^ 1.0 1.1 1.2 M 9.1 - off the west coast of northern Sumatra. USGS. ^ Tsunamis and Earthquakes: Tsunami Generation from the 2004 Sumatra Earthquake — USGS Western Coastal and Marine Geology. Walrus.wr.usgs.gov. [12 August 2010]. ^ Nalbant, S., Steacy, S., Sieh, K., Natawidjaja, D., and McCloskey, J. "Seismology: Earthquake risk on the Sunda trench." Nature. Vol. 435, No. 7043, 756–757. 9 June 2005. Accessed 16 May 2009. Archived 18 May 2009. ^ Japanese Shipwreck Adds To Evidence Of Great Cascadia Earthquake In 1700. Science Daily. [2003-10-31] （英语）. ^ Sam Schechner. Earthquakes vs. the Earth's Rotation - How major tremors alter the planet's wobble.. Washington Post. [2004-12-27]. （原始内容存档于2004-12-28） （英语）. ^ West, Michael; Sanches, John J.; McNutt, Stephen R. "Periodically Triggered Seismicity at Mount Wrangell, Alaska, After the Sumatra Earthquake." Science. Vol. 308, No. 5725, 1144–1146. 20 May 2005. ^ 信莲. 斯里兰卡海啸死亡人数超过3万，85万人无家可归. 中國日報. 2005-01-03 [2015-01-02]. （原始内容存档于2014-04-26） （中文（中国大陆）‎）. ^ 11.0 11.1 11.2 11.3 11.4 11.5 联合国公布各海啸受灾国情况. 新浪新聞. 2005-01-06 [2015-01-02] （中文（中国大陆）‎）. ^ 李国田. 泰国政府公布海啸灾情 共有5395人死亡. 新華網. 2005-04-20 [2015-01-02] （中文（中国大陆）‎）. ^ 英举行仪式悼海啸死者. 杭州日报. [2005-05-12]. （原始内容存档于2005-11-19） （中文（简体）‎）. ^ 再有三港人南亞海嘯罹難. 香港新聞網. [2005-09-06]. （原始内容存档于2009-04-04） （中文（繁體）‎）. ^ 海嘯捐款多未兌現. 蘋果日報. [2006-12-06]. （原始内容存档于2007-01-14） （中文（繁體）‎）. ^ 七國質疑泰國海嘯捐款去向. 大公報. [2006-12-06]. （原始内容存档于2007-09-30） （中文（繁體）‎）. ^ Japan raises aid to $500 million. CNN.com. [2008-05-20] （英语）. ^ Canada suspends debt for tsunami-hit countries. CTVglobemedia Publishing Inc. [2008-05-20] （英语）. ^ Taoiseach pledges €10m in aid. RTÉ Commercial Enterprises Limited. [2008-05-20] （英语）. ^ 南亞海嘯捐款 港突破11億. 香港經濟日報. [2005年3月31日]. （原始内容存档于2015年4月2日） （英语）. ^ Microsoft Commits $3.5 Million to Tsunami Relief Efforts. Hostreview.com. [2004-12-31] （英语）. ^ Citigroup Contributes USD$3 Million to South Asia Tsunami Tragedy Relief Effort. Citigroup. [2004-12-29] （英语）. ^ Unglaubliche Solidarität. blick.ch. [2004-12-29]. （原始内容存档于2005-01-01） （德语）. ^ Cisco Systems Issues Statement on Company Relief Efforts for Dec. 26 Earthquake and Tsunami. Cisco. [2004-12-29]. （原始内容存档于2004-12-30） （英语）. ^ Wal-Mart, SAM'S CLUB Join Tsunami Relief Efforts. Wal-Mart. [2004-12-30] （英语）. ^ Tetra Laval and Tetra Pak provide support for Tsunami disaster relief. Tetra Laval. [2004-12-30]. （原始内容存档于2006-11-14） （英语）. ^ The Walt Disney Company donates $1 million to Tsunami relief efforts. Mickey News. [2004-12-31]. （原始内容存档于2008-01-20） （英语）. ^ ING contributes USD 1 million to regions hit by tsunami. ING集團. [2004-12-30] （英语）. ^ First Data Western Union Foundation Donates US$1 Million to Aid Victims of Asia Tsunamis. First Data Corporation. [2004-12-28]. （原始内容存档于2005-10-27） （英语）. ^ GM - 2005 CRR: Economic: Community Investment: Performance. GM. [2008-05-21]. （原始内容存档于2008-05-12） （英语）. ^ HSBC pledges $1 million to tsunami appeal. HSBC （英语）. ^ Qantas Statement on Tsunami Relief. Qantas Airways Limited ABN 16 009 661 901. [2004-12-29] （英语）. ^ Why Donations are so Important. Bayer AG. [2008-03-20]. （原始内容存档于2012-07-20） （英语）. ^ Summing-up Nestlé's response to the tsunami disaster. Société des Produits Nestlé S.A. [2005-01-10] （英语）. ^ Disaster Preparedness, Response and Rebuilding. Homer TLC, Inc. [2005-05-17] （英语）. ^ Texas Instruments Makes $500,000 Donation to Aid Tsunami Relief Efforts. Texas Instruments Incorporated. [2004-12-30] （英语）. ^ INDONESIAN floods: The Group's involvement in action in Djakarta. Carrefour. [2007-02-12]. （原始内容存档于2007-03-27） （英语）. ^ South Asia Earthquake and Tsunami Disaster Relief. Hitachi, Ltd. [2005-01-27] （英语）. Magnitude 8.9 - OFF THE WEST COAST OF NORTHERN SUMATRA USGS, December 26, 2004 at 00:58:50 UTC. Sea surges kill thousands in Asia BBC News World Edition, December 26, 2004. Huge earthquake wreaks havoc The Weekend Australian, December 26, 2004. Massive Earthquake Batters Southeast Asia Associated Press report on Fox News, December 26, 2004. 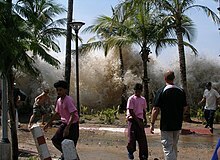 Tidal Waves Kill More Than 3,000 in Asia ABC News International, December 26, 2004. Indonesia 8.9-Magnitude Quake Unleashes Killer Waves Bloomberg, December 26, 2004 at 1003 UTC. 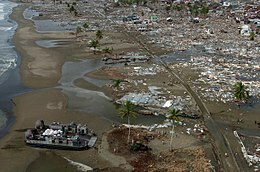 Death toll rises after quake, tsunamis strike southern Asia ABC News Online, December 26, 2004 at 1050 UTC. Quake, Tsunami Hit South Asia, 3,100 Feared Dead Reuters, December 26, 2004 at 1116 UTC. Asian quake kills thousands CNN International, December 26, 2004 at 1132 UTC. Tidal Waves Kill More Than 3,200 in Asia Associated Press report on The Guardian, December 26, 2004 at 1146 UTC.